Food-insecure children show smaller gains in math and reading achievement between kindergarten and third grade, and, from ages six to 11, a higher likelihood of repeating a grade. As a result of the economic recession, the number of Maryland children and families eligible for nutrition assistance has increased dramatically over the last several years. 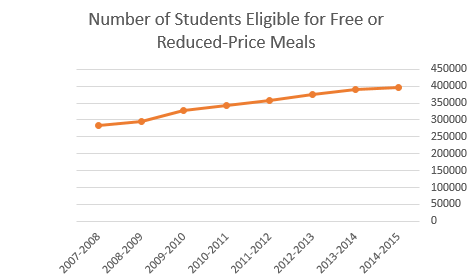 Between School Year 2007-2008 and School Year 2014-2015, the number of public school students eligible for free and reduced-price meals increased by 39%, with more than 45% of the student population now below the income threshold necessary to receive a free or reduced-price meal at school. There is strong research tying school meal participation to a number of positive outcomes for children, including: improved proficiency on standardized tests, reduced chronic absenteeism, and fewer disciplinary concerns. At the same time, despite three-quarters of American teachers identifying students who regularly come to school hungry, school meal programs are traditionally underutilized even by those eligible to receive assistance. In 2008, the Governor’s Office for Children and a national non-profit, Share Our Strength, launched the Partnership to End Childhood Hunger in Maryland in an effort to connect more eligible children and families to federal nutrition programs. Over the last several years, the Partnership has identified and implemented successful strategies to connect children and families to the School Breakfast and Summer Food Service Programs, among others, while drawing down millions of additional dollars in federal funding. While Maryland has made progress in connecting families and children to benefits, there is still work to be done to improve program delivery, streamline eligibility determination for multiple programs, and eliminate the duplication of effort by multiple State Agencies. In addition, the Governor’s Office for Children continues to work with non-profit partners to provide technical assistance to any of Maryland’s Local Management Boards interested in pursuing an anti-hunger strategy in their communities. The State’s current efforts to address childhood hunger are led by the Department of Human Resources and the Maryland State Department of Education. For information on State programs and specific Agency approaches, please refer to the Children’s Cabinet Strategic Direction and Implementation Plan. Nord, M. (2009). Food insecurity in households with children: Prevalence, severity, and household characteristics. U.S. Department of Agriculture, Economic Research Service. Families must have an income below 130% of the federal poverty level to be eligible for a free school meal and below 185% to meet the eligibility requirements for receipt of reduced-price meals.